"I don't need everybody to like me, I don't care." Magnolia Pictures has debuted the trailer for a film titled Nico, 1988, a music biopic profiling the life of singer-songwriter Christa Päffgen, better known by her stage name "Nico". She was one of Andy Warhol's muses and also the celebrated vocalist for The Velvet Underground, until she tragically died at age 49 in 1988. "Writer-director Susanna Nicchiarelli dives deep into the anguished and scattered psychology of Nico’s final years. She blends a tangible reverence for her subject with dark humor, crafting a riveting examination of a fragile artist constantly pushed to perform." Danish actress Trine Dyrholm stars as Nico, along with John Gordon Sinclair, Anamaria Marinca, Sandor Funtek, Thomas Trabacchi, Karina Fernandez, Calvin Demba, and Francesco Colella. The film premiered at the Venice Film Festival last year, and hit a bunch of other festivals before its release. Description from the Tribeca Film Festival: Danish actress and musician Trine Dyrholm delivers a high-voltage performance as Christa Päffgen—better known as Nico, the Andy Warhol darling and one-time chanteuse of the Velvet Underground. At the outset of Nico, 1988, Nico is approaching 50, tumbling down the slopes of drug addiction, and desperate to regain custody of her child. Her manager, Richard (John Gordon Sinclair), sensing her need for purpose, sets her on a tour across Europe; back on the road, she's equal parts tenacious, manic, and erratic. Nico, 1988 is written & directed by Italian filmmaker Susanna Nicchiarelli, director of the films Cosmonaut and Discovery at Dawn previously, as well as a few shorts. This first premiered at the Venice Film Festival last year, and played at numerous other festivals. 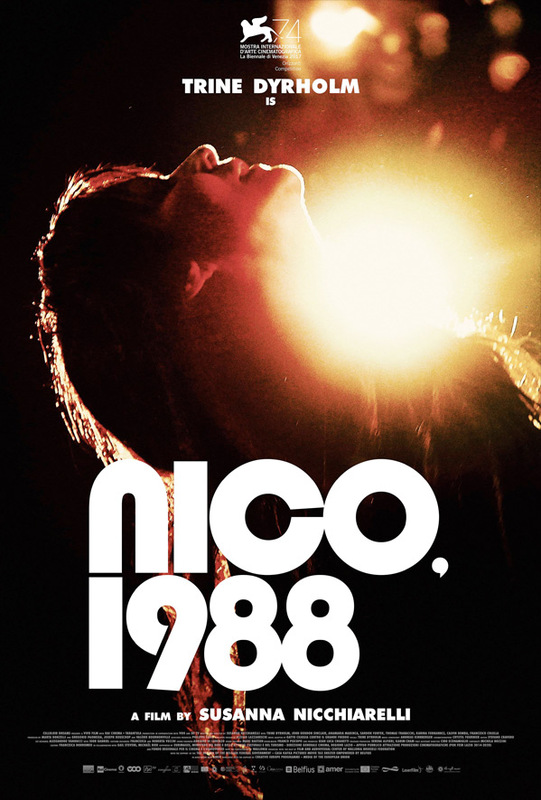 Magnolia will release Nicchiarelli's Nico, 1988 in select theaters starting August 1st this summer. Who's interested?